An easy way to hit the ball consistently well is for it to be in the same place every time you take your stance. As easy way to be an inconsistent ball-striker is to move the ball all over the place. Which one do you do? You can hit fat or thin with a perfect swing if you keep moving the ball around in your stance. These two videos show you how to put the ball where it belongs. Golf instruction books by some pros tell you to play everything off your left heel. That’s really beyond the capability of most recreational golfers. Other books tell you to put the ball opposite your left heel with long clubs and move the ball toward the center of your stance as you move down to shorter clubs. That’s asking you to have a different swing for each club. Again, no. One spot for your driver, one spot for a ball on the ground. You really can’t go wrong that way. The correct rhythm and tempo makes everything you do right fall into place. It is the glue that binds the swing together. Until you get this part right, all your other work is for naught. The correct rhythm is three parts backswing, one part downswing. Count from one to five as you swing. One is the moment you take the club way. Four is the top of the backswing. Five is impact. Three parts up, one part down. That’s it. Tempo is how long the one to five count takes. Swing as fast as you can while still controlling the club. Find your optimum tempo by hitting balls using the 3:1 rhythm. Start out by swinging slowly, even leisurely, at first. Gradually start picking up the overall pace of your swing, staying inside the 3:1 boundaries. 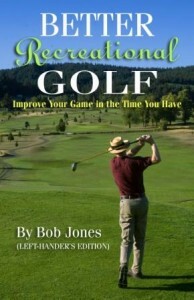 The assistance of a portable metronome keeps your swing speed consistent at each point, which controls the experiment. At some point you will find the ball leaving your clubface with authority, going high, straight, and far. Keep swinging faster just to make sure, but I promise you will reach a speed at which your swing just falls apart. That’s too fast. Slow back down to where you get those pure strikes. That is your standard tempo. You might be surprised at how fast it is. Use your pre-round warm-up to groove the 3:1 rhythm and find the tempo that is working, because tempo will vary from day to day. When you’re playing, a sudden decline in the quality of your shot-making often means nothing more than your swing rhythm is off. Take a few practice swings to remind yourself of the 3:1 rhythm. That should be enough to get you back on track. Here’s a rule of thumb for recreational golfers regarding iron play. Take the number of the club and add a zero to it. That’s the percentage of the time you should hit the green with that club. With a seven-iron, you should hit the green seventy percent of the time. Five-iron, fifty percent. And so on. If you can achieve this, and you play from the right set of tees, you should score pretty well. This is a factoid (does anybody use that word anymore?) I have mentioned before, but I want to develop the point today. There is a break-even distance in putting. That is the distance from which a golfer averages 2.0 putts. From farther away, the player would average more than two putts (three-putt more often that one-putt). From closer in, the average would be less than two putts. The break-even distance for the average recreational golfer is 15 feet. For touring professionals, the distance is just over twice that, about 32 feet. What I get from this comparison is to try to push that break-even distance out as far as I can. I will never have a professional golf swing, but there’s no reason I can’t be nearly as good with a putter. One of the putting drills I do occasionally is to hit ten fifteen-foot putts, without three-putting. Then I do the same from twenty feet, twenty-five feet, and thirty feet. Sometimes I do take three putts, but sometimes, one goes in! If you try this drill, don’t putt from the same spot over and over. You can’t groove your stroke when you play, so you shouldn’t do it when you practice, at least not in this drill. Oh, yes. You have to putt out. No fair giving yourself the leave. Sometimes you really blow it and leave your first putt four feet short. If you do it here, you’ll do it on the course, too, so you might as well get comfortable cleaning up your messes. As you do this drill, and start to get good at it, you’ll find yourself thinking deeply about how you putt from distance, looking for how to make long putts accurate and repeatable. That will only make you a better putter. What I get out of this drill is when I have a long putt, I feel confident I can leave it close to the hole, and sometimes luck will take over. That takes a lot of stress out of being on the green. Not to mention, it lowers your score. Get a good grip that fits your swing. This is two things. A good grip is one that has a chance of success. Many rec golfers I see play with a grip that is too strong or doesn’t leave the hands working together. See a pro, get a lesson, to be sure about yours. Also, you might have a fine grip, but it doesn’t go with your swing. If you have a neutral grip and a slice swing, that’s trouble. Learn the correct rhythm, and the tempo that is right for you. Rhythm is the same for everyone. This blog post shows you what rhythm is and how to get it. Tempo is different for everyone. Yours is probably too fast. Try this post to find your best tempo. Your hands must lead the clubhead coming into the ball. Most of you do the opposite, because you’re trying to hit the ball with your right hand. This is an easy idea to understand, but difficult to execute because our “hit” instinct is so strong. See this video. This one is really simple. First, get lessons on how to hit these shots. One lesson for each shot. They are their own kind of shot and need to be learned that way. Then, hit them using the iron method — one swing, different clubs. For pitching, you really need two swings, of different length, but for chipping, only one. Calibrate each swing and you can’t miss. Practice your standard strokes A LOT so they don’t slowly drift on you and make you wonder why you aren’t getting the ball close anymore. I commonly spend an hour on the practice green chipping and putting, mostly putting. 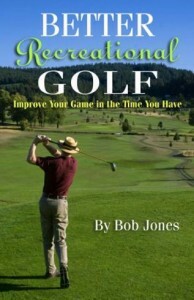 I see other rec golfers come on, putt for about ten minutes, and leave. Who is going to become the better putter? Use a pendulum stroke that moves in one unit from your shoulders to the clubhead. Do not let your wrists get involved. Find an alignment spot on the green in front of your ball and hit the ball right across it. Practice short putts, from two and three feet, A LOT. Hit these putts with authority. Do not finesse them into the hole. 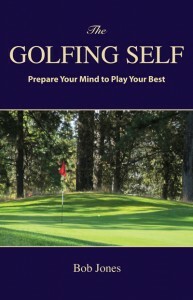 Calibrate your stroke so you can hit to fifteen feet, twenty-five feet, thirty-five feet, and forty-five feet at will. Practice these stokes at a hole to maintain them, and to learn how to add or take off a few feet because of differing green speeds. That takes care of ninety-five percent of golf. Learn the other things, bunkers, uneven lies, wind, a multitude of short game shots, after you have mastered the material above.